While the 3d and 5th Divisions moved north and then northeast up the center and west coast of the island, General Cates' 4th Division turned to the right to clear the one-third of Iwo lying east of Airfield Number 2 and south of Hill 362C. In this fantastically rugged area the Japanese had strengthened the natural defenses by digging and building, transforming the entire sector into a mighty fortress. The stoutest defenses in the area were at terrain features called Hill 382 (which the Japanese called Nidan Iwa), the Amphitheater, Turkey Knob, and the smashed village of Minami. During the days of desperate fighting required to seize and hold this incredible stronghold, these several closely related positions become known collectively as the "Meat Grinder". Nidan Iwa, 382 feet high, was located 250 yards northeast of the east-west runway of the airfield. The top of the hill, surmounted by the stark remains of a Japanese radar station, was hollowed out and rebuilt to contain field pieces and antitank weapons. Each of these concrete gun housings was in turn protected by as many as ten supporting machine-gun emplacements. The rest of the hill was honeycombed with the same elaborate tunneling that characterized other major installations on the island. In addition, crevices and ridges crisscrossed the entire surrounding area. Light and medium tanks, armed with 57mm and 47mm guns, parked well back in these crevices, commanded the length of the main (northeast-southwest) runway of the airfield and approaches from the southwest. MAJOR GENERAL CATES commanded the 4th Marine Division at Iwo Jima. Early in the morning of 25 February the 21st Marines reverted to the 3d Division, and the line of demarcation between RCT 21 and RCT 24 became the 4th Division left boundary. Airfield Number 2, except for the eastern one-third of the east-west runway and the northeast tip of the long runway, now lay in the 3d's zone of action, but the entire eastern bulge of the island remained the responsibility of the 4th. At 0630 the 23d Marines reverted from corps reserve to parent control and prepared to attack abreast of the 24th Marines by passing through that regiment's left unit. The assault was to be made in a column of battalions with 1/23 following 3/23 at 600 yards, and 2/23 in reserve. The 24th Marines, with 2/25 attached, would continue the assault with 3/24 on the left, 1/24 on the right, and 2/24 reverting to regimental reserve when relieved by 3/23. The 25th Marines, less 2/25 remained in division reserve. The division made its main effort on the left with RCT 23 maintaining contact with the 3d Division, which was making the corps' main effort up the center of the island as related in Chapter V. Since tanks could not operate effectively over rough terrain on the right, most of the armored support went to 3/23. Enemy antitank weapons and mines blocked movement of vehicles to the front through the 4th Division zone of action, so permission was requested and received to send the tanks forward through the 3d Division zone to firing positions along RCT 23's left boundary. Using this approach, the mediums effectively supported infantry troops by destroying enemy antitank guns, pillboxes, and machine-gun emplacements. But not until about 1430 did engineers, working with an armored bulldozer, succeed in clearing a route for tanks to move forward through RCT 23's zone of action. difficult for 3/23 to maintain contact with RCT 9 on its left. The 24th Marines jumped off with its 3d Battalion (plus Companies E and G, 25th Marines) on the left, and the 1st Battalion (with Company F, 25th Marines and Company A, 2d Armored Amphibian Battalion attached) on the right. Artillery, naval gunfire, and carrier planes shelled, bombed, and strafed the Amphitheater and Minami areas before the attack. During the air strike battalion 81mm mortars fired a 200-round preparation close to the lines. Armored amphibians from Company A, 2d Armored Amphibian Battalion, tried to support 1/24 from positions off the east coast as on previous days, but choppy seas so limited their effectiveness that they were withdrawn. LOOKING SOUTH FROM TOP OF AMPHITHEATER. 4th Division Marines had to cross this relatively flat and open ground to reach the strong enemy positions in the area. to 3/24 to assist that unit, but because of extremely rough ground these proved of little value. After a gain of about 100 yards both battalions were stopped by very heavy and effective fire of all kinds. As usual, key officers and noncommissioned officers were among the casualties taken during this morning attack, including the commander of Company A, 1/24 who was wounded and evacuated. Early in the afternoon an air strike along the high ground in front of 3/24 put a temporary damper on the mortar fire, enabling Marines to inch forward for short gains. The 2d Battalion, 24th Marines, relieved by 3/23 at K-Hour, spent most of the day in RCT reserve resting and reequipping, but this respite was brief. At 1530, 2/24 received orders to move up and relieve 1/24 on the right of the regimental line. This hasty relief took place without casualties, and the battalion spent a relatively quiet night on position. Along the rest of the 4th Division front Japanese attempted to infiltrate front lines, and enemy shells fell in both forward and rear areas sporadically throughout the hours of darkness. Fire support ships fired normal night missions,4 with mortar gunboats providing large area neutralization, and an LCI firing 40mm rounds into enemy mortar and rocket positions along the coast. The second day of struggle for Hill 382 and the Amphitheater dawned bright and clear, but during the afternoon light showers and a lowering ceiling interfered with air activities over the island. Bad weather between Iwo and the Marianas prevented bombers of the Seventh Air Force from making scheduled strikes. 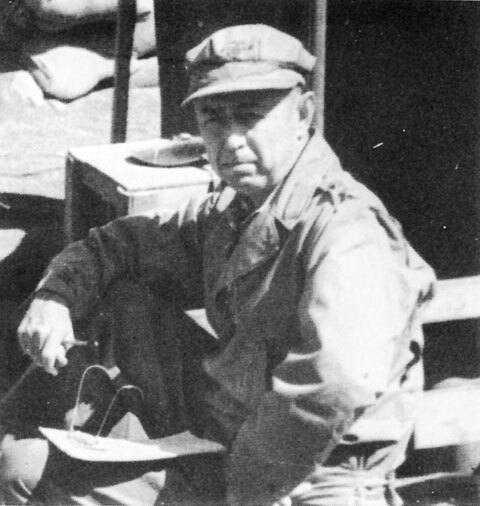 General Cates had alerted the 25th Marines to pass through the 24th, and at 0530 the battalions started moving up. The 1st Battalion was to relieve 3/24 on the left, the 2d was to go into the center of the line, and the 3d would replace 2/24 on the right flank. The 1st and 3d Battalions executed the relief and were ready to attack on time at 0800, but 2/25, which had been attached to RCT 24, experienced difficulty extricating its companies and shifting them to new positions, so the jump-off was delayed until 0820. After being passed through, the 3d Battalion, 24th Marines became attached to RCT 25 as regimental reserve, the rest of the regiment reverting to division reserve. Patrols from 1/24 thoroughly searched all destroyed enemy vessels on Beaches BLUE 1 and 2, from which occasional rifle and machine-gun fire had harassed the division's rear along the coast, but most of the day was spent in hasty reorganization and re-equipping. Company C (1/25) sent one platoon supported by a tank around its right flank to envelop the enemy at Turkey Knob and silence some of the intense opposition. As the platoon worked toward the Knob, Japanese mortars shifted their fire and caught it in a barrage that killed several men, including the platoon leader. With its commander gone and hostile mortar and machine-gun fire increasing, the unit withdrew, using a smoke screen to cover evacuation of casualties. In the center of the 25th Marines' line 2/25 also met stubborn and constant resistance from countless caves and pillboxes to its front. The chaotic terrain that aided the Japanese defense in this zone of action also prevented the use of tanks, 75mm halftracks, and 37mm guns. Both assault companies suffered heavy casualties and marked up insignificant gains. At 1500 Company E passed through F, on the right and the latter unit set up a secondary line of defense. Along the coast Company I, 3d Battalion, 25th, aided by two Shermans and LVT(A)'s, spent the day mopping up the East Boat Basin area, while on the left Company L progressed slowly against stiff resistance. The reserve company cleaned up behind the advance and sent elements to the left to cover the boundary where 2/25 lagged behind the more rapid advance of 3/25. On the left of the 4th Division zone of action the 23d Marines jumped off at 0800 in a renewal of its assault against Hill 382. Where he had attacked the day before in a column of battalions, Colonel Wensinger now spilt his zone and committed the 1st Battalion on the left of the 3d, both units in a column of companies. When the 1st Battalion passed through Company K (3/23) with Company C in the lead, it immediately received a blast of heavy and accurate fire. Japanese weapons on and around Hill 382 poured a deadly barrage against the lead company's front, while other hostile fire struck the left flank from positions in the 3d Division's zone where 1/9 fought for control of the northern portion of the airfield and commanding ground beyond.6 Successive mine fields on the taxiway of Airfield Number 2 and in the vicinity of the radio weather station, between the field and Hill 382, limited employment of tanks in close support of the infantry. But Shermans of Company C shuttled back and forth between rearming points and the front lines to blast enemy installations on the hill. Two tanks were destroyed by land mines and a third damaged during this day-long action. On 1/23's right, 3/23 met the same well-directed fire but moved doggedly ahead, reducing the hill's forward supporting positions with flame, rockets, and demolitions. Advance elements of Company I, spearheading the attack, reached the southwestern slopes of Hill 382 late in the afternoon, but enemy rocket and mortar fire drove them back. After both battalions had returned to tenable positions for the night net gains for the regiment totaled about 200 yards. Ammunition expenditures throughout the day had been high, and infantry carrying parties worked well into the night to bring replenishment supplies forward across fire-swept areas. Throughout the hours of darkness enemy infantry prodded Marine lines, and hostile mortar fire harassed both front and rear areas. At 0535 Company I, 23 Marines, heard the sound of tanks to its front and reported enemy preparations for a counterattack. Artillery was called down on the general area and the suspicious activity ceased. 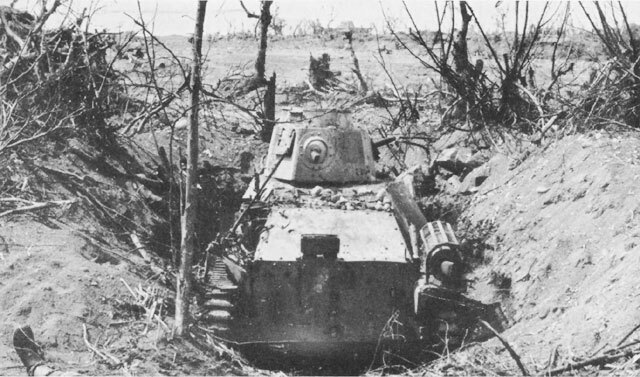 LIGHT JAPANESE TANK dug in to cover approaches to Airfield Number 2. The enemy did not move his tanks but derived maximum benefit of their fire power as stationary high-velocity artillery pieces. In the 23d Marines' zone of action the Japanese again resisted fiercely from Hill 382, repulsing attack after attack from the west. But northwest of the hill, on D-plus-8, the left flank of 1/23 gained 150 yards against diminishing opposition. In its zone of action on the right, 3/23 pushed close to the top of 382. 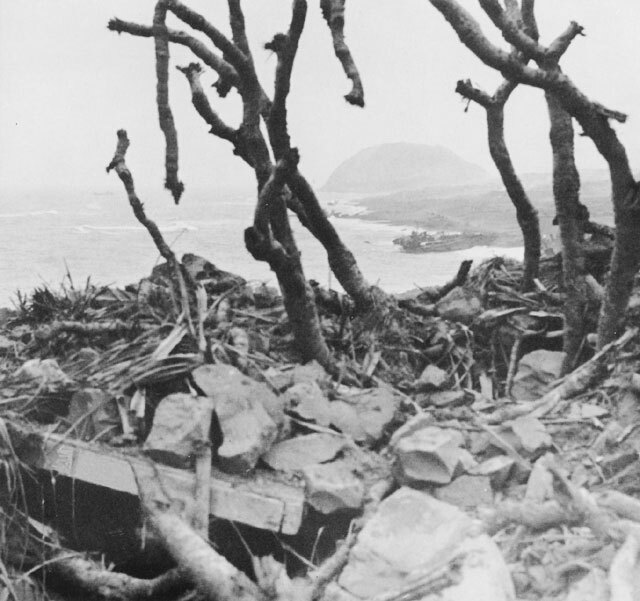 Elements of this battalion engaged in a raging hand-to-hand battle with the enemy around the ruins of the Japanese radar station, only to be driven off the crest by a heavy artillery and mortar barrage. A tank bulldozer and engineers labored most of the day clearing a route forward for Company B tanks, and by later afternoon the Shermans worked their way forward to support the infantry. When orders were received to consolidate on the most favorable ground with solid contact left and right, 3/23 withdrew its advance elements to approximately the morning line of departure and dug in there. 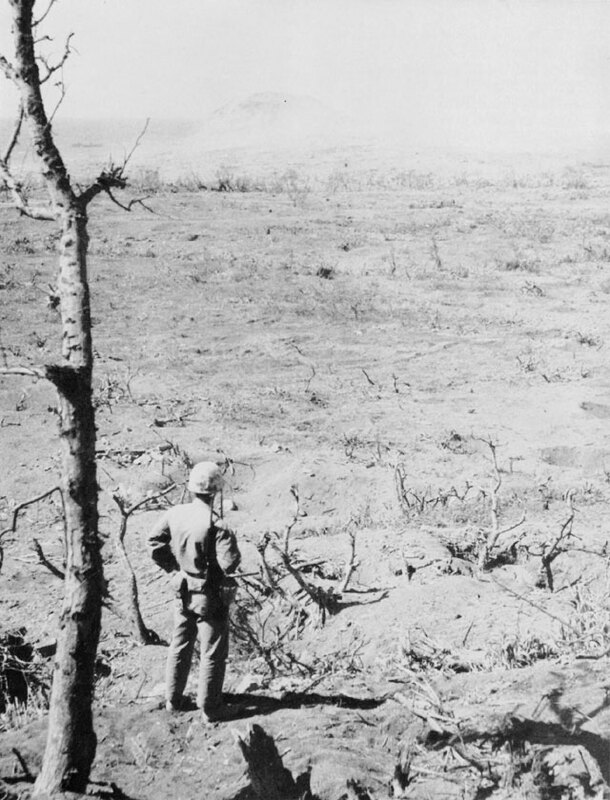 SOUTHWEST SLOPES OF HILL 382 pictured after Marines of the 4th Division had secured the area. naval gunfire against the drop zone to destroy the cargo and enemy troops attempting to recover it. On the right, 2/23 moved slowly forward up the corridor in column of companies against heavy fire from camouflaged bunkers and pillboxes. By 1200 Company G had pushed forward 200 yards, but then enemy fire hit Marines from both sides and halted the advance. At this time one platoon of Company F was committed on the right to gain the rising ground along the regimental boundary. This maneuver proved only partially successful as 1/25 (on RCT 23's right), was unable to seize and hold the elevation, and the platoon found itself face to face with enemy troops protected in emplacements concealed by heavy brush not more than 15 to 25 yards to the front. This platoon held the ground it gained and remained in these positions on 2/23's right flank. In addition to the assault on Hill 382, the 1st Battalion, operating in the left of the regimental zone, had the responsibility of maintaining contact with the 9th Marines, now beginning to move out more rapidly northeast of the airfield. This job fell to Company E, 23d Marines,11 while Company A hammered against the hill. One platoon of Company E became separated from its parent unit and followed RCT 9 several hundred yards into the 9th's zone of action before it could be halted and returned to the company. At 1000, elements of Company B moved up on the left to help maintain contact across the boundary. Progress on the left advanced Company A around the north side of the hill during the morning, and at 1415 this unit launched an attack to envelop the rocky elevation's reverse (eastern) slopes. During the assault bazooka men closed in under heavy fire and eliminated two enemy tanks that had previously escaped destruction because of their defiladed positions. With these guns silenced, the rest of the company moved to positions from where it could engage the entrenched enemy on the east slopes of the hill. Although the Marines had virtually surrounded Hill 382 by this time, enemy defenders still resisted savagely with mortar, rocket, and artillery fire from positions in the rocky wilderness to the east. Antitank weapons, mines, and rough terrain continued to limit the use of tanks in close support of infantry on D-plus-8 and 9, but the tankers pushed forward as far as possible to deliver overhead fire. The 14th Marines fired close-in preparations before the jump-off, then lifted fire ahead of the troops to neutralize enemy small arms and automatic weapons. One of the primary and most difficult tasks of artillery was locating and silencing hostile mortar, artillery, and rocket installations. All corps and division observation and intelligence agencies cooperated in the detection of Japanese weapons, but it was a slow process. against the Amphitheater, Turkey Knob, and the Japanese front lines that extended southward from the Knob to the coast just east of the Boat Basin. Companies A and C were ready to move out in the assault at 0800, but 3/23 had not yet advanced far enough in its zone to permit the jump-off by 1/25. The 1st Battalion delayed moving until 1500 when it passed Company A through the elements on its left to launch the assault. This attack was supported by tanks and preceded by an intense rocket barrage. The first 150 yards of the route led across an open area and, as troops and tanks advanced, enemy weapons of all kinds opened up with deadly fire. Two of the tanks were knocked out by 47mm antitank shells, and a third was hit but managed to limp back to the rear. 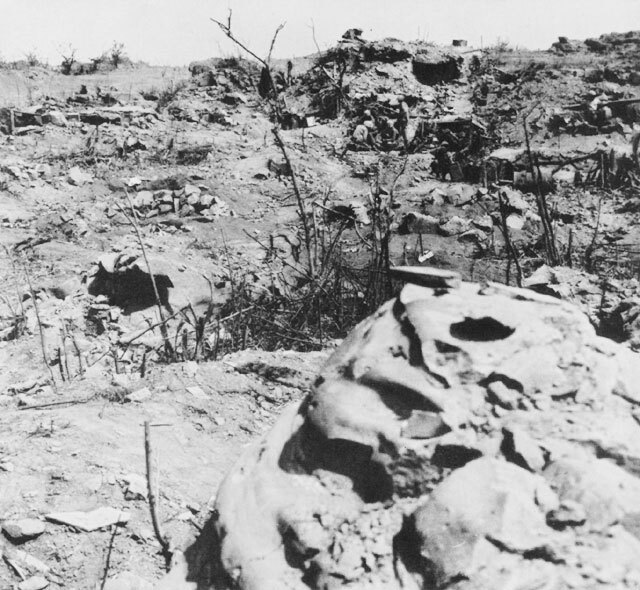 Heavy machine-gun fire from around the Knob raked advancing Marine lines, causing numerous casualties and making positions along high ground above the Amphitheater untenable. At 1715 the battalion commander ordered Company A to fall back to the line held on the previous night, and 1/25 consolidated with A on the left and Companies C, L (3/24), and B extended to the right (southeast) to tie in with 2/25. The 2d and 3d Battalions, attacking on the 1st Battalion's right, moved out directly forward on D-plus-8. In the center, 2/25 ran into a stubborn enemy strong point in the left of the battalion zone. Company G spent the entire morning trying to overcome this resistance, and about noon Company F relieved G and continued the assault. Two tanks were assigned to support that company, but the terrain limited their use and made it impossible to bring regimental 37mm and 75mm guns to bear. The 3d Battalion, on 2/25's right achieved greater success. Company I secured the East Boat Basin and moved to high ground overlooking the Basin to tie in with Company L's right flank. Companies L and K gained about 200 yards during the day, but held up when further advances would have made it difficult to maintain contact with the slower-moving 2d Battalion on the left. Company K, 3/24, joined 3/25 during the afternoon to help strengthen the lines for night defense. The employment of three, and sometimes four, companies on line across a single battalion front was common throughout the operation in the 4th Division zone of action. The rugged terrain limited observation and fields of fire to a few yards, making it necessary, particularly at night, to maintain physical contact along the front. It often became necessary to commit two understrength companies on a frontage that, in open terrain with full-strength units, could be covered by one company. The 25th Marines moved out again at 0815 on D-plus-9 with the same scheme of maneuver as the day before. The 1st Battalion passed through the right flank of RCT 23, with Companies A, C, and I (3/24) in column, to attack Turkey Knob from the north, while Company B stayed on the low ground southwest of the Knob to assault eastward around the base of the Amphitheater to contact other elements of the battalion, thus completing a double envelopment. about 50 yards into a patch of woods just north of the Knob. As Marines reached this point, the enemy loosed a terrific mortar and rocket barrage, and machine guns directed a withering fire from high ground to the battalion's front and exposed left flank. Artillery observers with the 1st Battalion called counterbattery missions, but the Japanese fire did not abate. By 1200 the situation became critical. Company A and one platoon from Company C had suffered heavy casualties and were unable to advance. But the successful double envelopment of the Knob depended upon the woods being held at any cost to enable Company B to make contact at that point. At 1215 the rest of Company C moved into the woods followed by Company I, and at the same time Company B, with two tanks attached, jumped off in its attack against the high ground east of Turkey Knob. As Company B moved out, enemy troops, well established and dug in on the high ground, threw mines and grenades down on the Marines, and machine guns enfiladed the entire front. A mine soon disabled one of the tanks, and at 1630 Company B fell back to its former position. During this attack, two other tanks worked forward to the front lines of Company A (northwest of Turkey Knob) and fired against the thick walls of the large concrete communications installation atop the Knob. The 75mm shells had little effect, however, and no further advance was made. By 1645 it became apparent that there would be no junction between the two enveloping forces and that the advance positions of the three companies above the Amphitheater could not be held during the night. Therefore, using smoke to cover their movement, these units withdrew to the morning line of departure. On the 1st Battalion's right, the 2d Battalion attempted to extend its left flank to support the attack of Company B and push forward to seize the commanding ground to its immediate front. 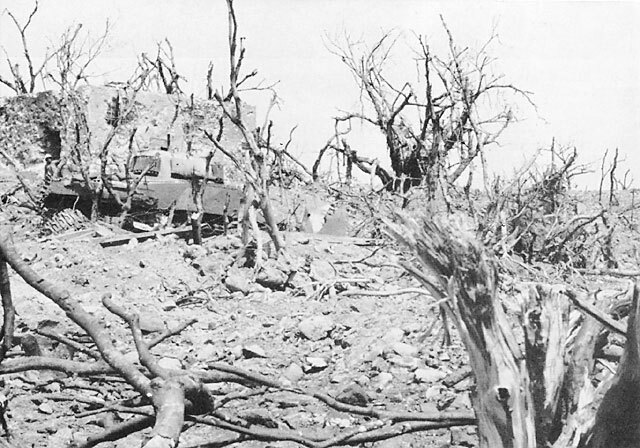 Once again terrain prevented the use of tanks and half-tracks to support the infantry, and heavy enemy fire, particularly from pillboxes in the left of the battalion zone, held up the advance. At noon the battalion commander requested that a 75mm pack howitzer be sent up to support his assault from positions inaccessible to the Shermans and half-tracks. It was a slow and difficult task, but by 1500 a gun crew from 1/14 had a howitzer set up ready to operate. This piece placed 40 rounds of direct fire against the enemy strong point and, while the position was not destroyed, the shelling neutralized it sufficiently to allow Company F to advance some 75 yards to a position from which it destroyed this installation the next day. The battalion was closely engaged with the enemy until about 1900, but by 2000 the lines were consolidated and the pack howitzer returned to the artillery battalion an hour later. 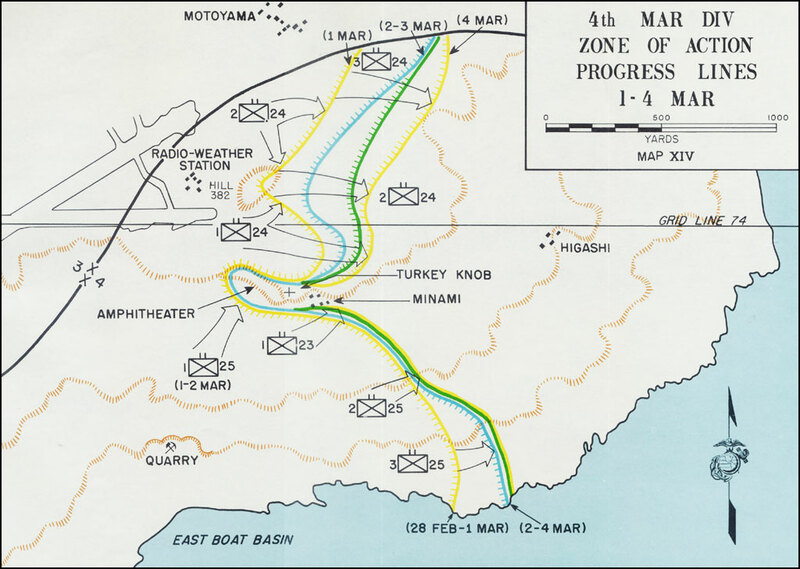 The 25th Marines' right flank battalion, 3/25, regulated its advance with that of the unit on its left. Early gains were fairly rapid, 100 yards by 1000, but when 2/25 held up so did 3/25, and no further progress was made during the day. It is interesting to note that the largest infiltration attempts against the 4th Division lines the night of D-plus-9 and early morning of D-plus-10 were in the sector of 3/25, which had experienced the lightest resistance during the day. These occurred at 2200 and again at 0230. Both efforts were repulsed with an estimated 200 casualties to the enemy. hill north and south and were in position to bypass the Amphitheater and continue the push to the east coast. The corps order for D-plus-10 (1 March) directed the 4th Division to continue the attack, maintaining contact with the 3d on its left, but to hold present positions south of grid line 7419 except as necessary to maintain contact left to right. Since this line ran east and west about 200 yards south of Hill 382, this meant that the division's main effort would be against the hill and along the boundary with the 3d Division. Early in the morning RCT 24 began relieving units of RCT 23. The move, and most of the relief, occurred under cover of darkness with small units of RCT 24 taking the place of like-sized units of RCT 23, being careful to avoid engagement with the enemy during the shift. K-Hour (0830) was preceded by a coordinated 45-minute corps artillery and naval gunfire preparation and an intensive bombardment by division artillery from 0820 to 0830 that lifted in successive concentrations after K-Hour. The 24th Marines moved out with the 1st and 2d Battalions abreast, 2d on the left. Each battalion employed two companies in the assault. Both companies of 2/24 came under heavy artillery and mortar fire immediately, but it was particularly severe in front of Company F on the left. The battalion requested supporting fires to silence the enemy artillery, and at 0935 carrier planes struck hard with napalm about 600 yards ahead of Marine lines. An hour later 155's of corps artillery pounded the same area, followed by a naval gunfire barrage. It took three hours to obtain these deep support fires against enemy weapons that had been registered on front line companies since 0700. When received, however, this support quieted opposition considerably. Company F advanced about 150 yards in the afternoon. During the morning Company F extended itself across the division boundary to maintain contact with the 3d Division. In the afternoon, although 2/24 gained steadily, the 3d Division moved more rapidly, and a gap developed along the boundary. At 1430 RCT 24 sent two companies of its reserve battalion to regain contact on the left flank. 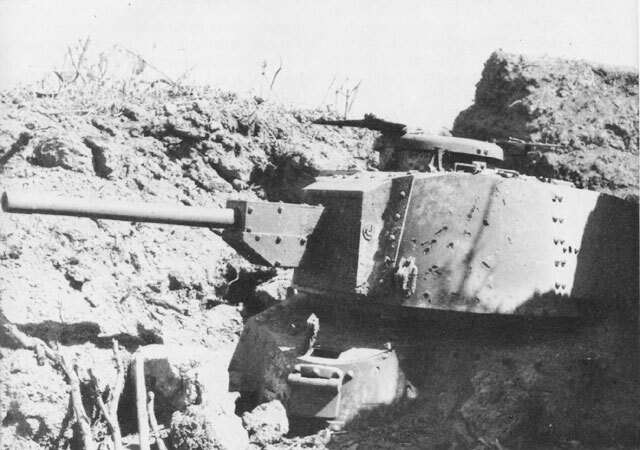 JAPANESE MEDIUM TANK present difficult target for Marine guns as it huddles in deep crevice on west slope of Hill 382. This weapon was sited to cover the length of Airfield Number 2.
ridge, and Japanese mortars and artillery pounded the crest and slopes of 382 in desperate barrages, seemingly careless of damage done to the Japanese defenders. Late in the afternoon the battalion commander of 2/24 and his company commanders made a thorough reconnaissance of Hill 382 to select positions for the night and to plan the next day's attack. During this inspection hand grenade fights were in progress, and assault squads were still blowing cave entrances and using flame throwers on remaining points of resistance. and smoke was called in to cover the evacuation of casualties. The company reorganized quickly under a new commander and at 1300 resumed the attack behind a heavy Marine artillery and mortar barrage. Two minutes after this second jump-off the new commander became a casualty and a second replacement came forward to take over the unit. During the afternoon Company C gained some of the high ground, and at 1700 began consolidation of positions. On D-plus-10 the regiment made its greatest progress on the left where 2/24 moved about 100 yards to the east along the division left boundary, and on the right flank where 1/24 advanced half that distance to gain a foothold on high ground overlooking Minami. In the center, however, RCT 24 had engaged in a day-long see-saw battle in the labyrinth of miniature canyons on Hill 382 with no noticeable change in the lines. The 1st Battalion's plan of attack was the same as on the previous day: to effect a double envelopment of Turkey Knob by moving three companies along the high ground (from the northwest) above the Amphitheater to attack southeast against the Knob while Company B assaulted from the low ground south of this fortress to make a junction with the other prong of the attack. Company I, 3/24, which had participated in the attack with 1/25 during the last two days, was relieved at 1000, but Companies I and K, 23 Marines reinforced this battalion (1/25) to renew the assault. HUGE CONCRETE COMMUNICATIONS BLOCKHOUSE	near Turkey Knob. This installation withstood days of direct assault by flame and gun tanks. Sherman next to blockhouse is disabled. Company C led the attack this time, replacing Company A as the spearhead, with I and K (3/23) following in that order. By 1000 these three units had crossed the open area and entered the woods but met the same rain of fire that had mauled them the day before. Artillery forward observers again called counterbattery fire, and air spot was requested. Marine artillery had little immediate effect on the hostile mortars, however, and aerial observers could not locate the origin of the enemy barrage. Company B jumped off at noon in the face of a steady fusillade from machine guns and rifles, accompanied by frequent volleys of rifle grenades and mortar shells. All afternoon Marines pressed the attack, but Company B failed to gain the elevation to tie in with Company C north of the Knob. As a result, all units were once more ordered to withdraw from their exposed locations to morning positions. As the depleted companies started to pull back the enemy laid down a heavy barrage all along the front, and Marines called for a smoke screen to cover the withdrawal and evacuation of casualties. The two battalions on the right made only minor improvements in position on the morning of D-plus-10. The 2d advanced its left through machine-gun and knee-mortar fire to straighten the line, but did not attempt to move in the afternoon. Forward observers directed the fire of 1/14's 75mm howitzers against targets to the front, and a tank blasted at enemy installations from a position in the 3d Battalion's zone of action. North of the grid line RCT 24 changed boundaries between battalions to swing the direction of attack around toward the southeast so that the regiment would be striking down corridors instead of across them. The 3d Battalion (less Company L in RCT reserve) was to attack on the left (north) flank, while 2/24 in the center continued its efforts to reduce Hill 382 and seize the next ridge to the southeast. The 1st Battalion would drive forward in a narrowing zone of action until pinched out between 2/24 and 1/25. Although facing stiff opposition and encountering difficulty in keeping contact with 1/9 on the left, the 3d Battalion advanced about 300 yards. In the center, however, the 2d Battalion finally overran Hill 382, in a more significant action. At 1100 the battalion commander met with his company commanders at the reserve company command post for a conference. The two assault companies were bogged down and receiving intense machine-gun and large-caliber mortar fire. Something had to be done. it was decided that one platoon of Company E, with two tanks, should move around to the right to outflank the enemy holding up the advance. Hoping to catch the enemy off guard, the 1st Battalion, 25th Marines, jumped off at K-minus 90 minutes (0630), without normal preparatory fires, to infiltrate and again seize the high ground north of Turkey Knob. With no change in plans, Companies C (1/25) and I (3/23) were to envelop from the northwest while Company B moved up from the south. For the first few minutes things went well. Then, at approximately 0650, the enemy opened up with rocket and mortar barrages and close-in fire from machine guns. Marine retaliation was swift, as friendly artillery and mortars lashed out in reply, and eight tanks rumbled forward to support the attack. One thousand gallons of flame thrower fuel and many 75mm shells were hurled against the large communications blockhouse that dominated Turkey Knob, but could not crush enemy resistance. By 1430 Company B, working north onto the high ground from positions south of the Amphitheater, was only 65 yards from a junction with Company I, and the double envelopment seemed almost completed. But at 1445 the enemy unleashed a crushing barrage, causing Company B to fall back with many casualties. With both flanks now exposed, positions of companies on the high ground became untenable, and the battalion commander ordered his units to withdraw for the night. At 1730, replacements reached the battalion and were immediately placed in the lines to help the exhausted and depleted battalion cover its assigned sector during the night. In the center, 2/25 was ordered to extend its left flank to assist the advance of Company B, and Company L, 3/23 was attached for that purpose. But progress on that flank was slow, with F and L making no appreciable gains. The irregularity of the lines and the proximity of enemy and friendly troops along most of the front made close support by artillery and direct support ships difficult, but corps and division artillery, with two battleships and one cruiser in general support, were quick to bring down heavy counterbattery fire on active enemy guns. Destroyers and gunboats came close in along the eastern bulge of the island to place well directed fire up rocky draws that led down to the sea. On 3 March the 4th Division jumped off at 0630 without benefit of preparatory fires, hoping to gain at least a temporary advantage through surprise. At 0500 the 23d Marines relieved RCT 25 and passed 1/23 through 1/25 at K-Hour, but 2/25 and 3/25 became attached to RCT 23, retaining their positions in the center and on the right. 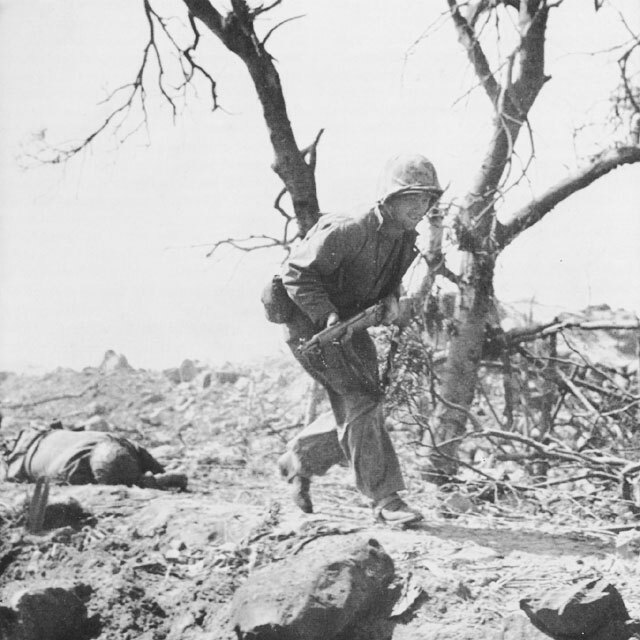 The 24th Marines continued the assault in the division's left zone of action. Shermans of Company C, 4th Tank Battalion and one platoon of the 4th Engineer Battalion were attached to 1/23 for the regiment's main attack southeastward above the Amphitheater to make contact with the left element of 2/25. This would complete reduction of the Knob and isolate enemy troops in the Amphitheater. Immediately after the jump-off, corps and division artillery pounded areas forward of the front lines with heavy neutralization fires, and initial gains were encouraging as the enemy seemed taken by surprise.27 As the right flank units of 1/23 neared the blockhouse atop Turkey Knob, however, heavy fire stopped the advance. This huge concrete structure had already withstood two days of close assault and still constituted a serious obstacle to further progress. Routes of approach were mined and covered by accurate machine-gun and rifle fire. Engineers courageously weathered this to clear a path to allow a flame tank close access. The slow and costly assault, which continued until late afternoon, partially reduced the Turkey Knob blockhouse, and Company B, the reserve unit, passed through Company C to continue the attack to make contact with 2/25. Intense enemy fire and antipersonnel mines checked this assault also after only a short advance, and units consolidated for the night with the enemy salient still intact. The 23d Marines' center and right battalions held their positions while 1/23 attacked. The 3d Battalion regained control of Companies I and L, which had been attached to 2/25 and 3/25, and remained in regimental reserve. Company K, however, with tanks and 75mm half-tracks, attached, spent most of the day burning and blasting enemy positions in the southwestern face of the Amphitheater, and Company I was committed toward the end of the day to fill in south of the Amphitheater between 1/23 and 2/25. The 2d Battalion, 23d Marines, still in corps reserve, remained in an assembly area between the first and second airfields, prepared to move to the attack anywhere in the corps zone of action on 2-hour notice. was controlled by machine-gun and rifle fire. With enemy mortars and artillery registered to cover defiladed areas. Only with the greatest difficulty could tanks move forward to favorable locations to engage enemy targets in this region, and once they were in position could command only limited fields of fire. Artillery could be used for close support at ranges over 100 yards, but as the infantry closed on hostile positions, 81mm and 60mm mortars fired within 50 yards of the advancing Marines. As had been true throughout the operation, only through the slow and tedious maneuver of infantry teams employing demolitions, flame throwers, bazookas, and grenades could such a stronghold be reduced. This type of fighting required able and aggressive leadership at the small-unit level, and the high casualty rate among junior officers and noncommissioned officers seriously retarded the progress of the attack. Despite the difficulties involved, men of Company B (tanks) wrestled their Shermans forward along the narrow, twisting routes of approach and provided effective support whenever possible. Rocket launchers also added their barrages to those of the artillery and mortars, making quick runs to firing positions near the front, then withdrawing hurriedly to escape countering fire from enemy weapons. During the eight days of deadlock and fierce conflict in the Hill 382 and Turkey Knob areas, the weather had been generally favorable. Mild temperatures and fair skies predominated, although early in the morning ground haze combined with smoke to limit observation, and on a few days light showers fell in the afternoon. Night temperatures sometimes went below 60°, and it was then that tired Marines were grateful for the characteristic subterranean heat of the island that warmed their foxholes.28 The next day, 4 March, dawned gray and sullen, and intermittent showers fell from the overcast skies. Visibility was so limited that all air strikes were canceled and aerial observation seriously curtailed. The division continued the assault on 4 March with no change in formation or direction of attack. The main effort was on the left with the 24th Marines pushing southeast. On the right, 2/25 and 3/25 held their positions while 1/23 attacked in conjunction with RCT 24 on its left. The axis of advance was directed to the southeast so that the Marines could drive down the draws that led from Hill 382 to the coast rather than across those terrain compartments. Naval gunfire and artillery supported the attack with normal preparatory and supporting fires, but due to lowered visibility most of the missions were controlled by ground observers rather than air spot. One destroyer and a gunboat worked all day along the coast locating and engaging targets in the cliffs and draws. The infantry battalions made extensive use of the indispensable 60mm and 81mm mortars to give close support. The 81mm ammunition supply situation was still unsatisfactory, however, and expenditures were controlled. The 60mm mortar fire covered areas to within 30 yards of the lines to pin down and neutralize the enemy to the immediate front. Tanks and rocket launchers were used whenever and wherever possible, with flame tanks being particularly valuable in aiding 3/23's mop-up operations against the partially bypassed Amphitheater. KEEP LOW AND KEEP MOVING. Enemy riflemen proved to be good marksmen in the close fighting on Iwo and Marines had to move quickly from one covered position to another. efficiency among those who engaged in attack after attack. EAST OF MINAMI the terrain became even more wild and broken. 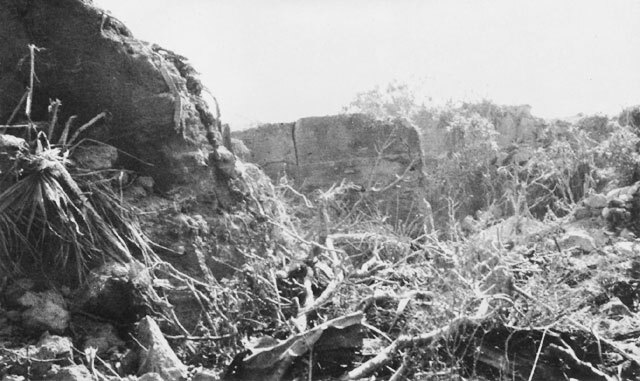 Japanese mortar positions, concealed and protected by the jumbled rocks, remained active until the area was overrun. Company L, 3/25 into a provisional battalion commanded by the executive officer of 1/25, Major Edward L. Asbill. The above shifts comprised the major changes in the 4th Division lineup on 5 March. Minor adjustments along the 24th Marines' front released three companies to form a regimental reserve line in that zone of action. With reorganization completed by 1200, the remainder of the day was devoted to strengthening defenses, re-equipping, and rest. Artillery, naval gunfire, and air executed call fires throughout the period, paying particular attention to neutralization of enemy mortars that harassed the 4th Division front. The 2d Battalion, 23d Marines reverted from corps reserve at 1500 and was replaced by 1/23. The day ended with the 24th and 25th Marines in the line, each with three battalions abreast. The new Composite Battalion, 25th Marines contained the enemy salient between 1/25 and 2/25 and the 23d Marines, less 1/23, was in division reserve ready for the attack on 6 March. The corps operation order for 6 March called for an all-out artillery and naval gunfire preparation followed by a two-phase assault to the northeast and east by elements of all three divisions.31 The 4th Division was directed to attack at K-plus 60 minutes (0900), making its main effort on the left in conjunction with the 9th Marines. The coordinated fires of 12 artillery battalions, reinforced by naval gunfire, shifted to support the second phase of the corps attack at K-plus 45 minutes. In the 4th Division zone of action the barrage was concentrated on the left where RCT 23 was to pass through RCT 24 in a column of battalions to make the main effort in a drive southeastward. The 2d Battalion, 23d Marines jumped off at 0900 and 3/23 moved up to follow at 400 yards. Assault elements instantly ran into accurate automatic-weapons and rifle fire from the front, and Company F on the right held up after an advance of only about 50 yards. On the left, however, the terrain was suitable for tanks, and Company G with four supporting Shermans gained 300 yards. When the right unit's attack stopped, Company E (in reserve) was ordered to pass through the gap between Companies G and F. As the reserve company executed this movement, it came under an extremely heavy mortar barrage that wounded the company commander and inflicted numerous other casualties. The executive officer assumed command, reorganized quickly, and pushed on to accomplish the maneuver. Company E continued its attack and by 1500 had forced two platoons abreast of the two flanking assault companies despite constant withering fire from the front. Forward observers called artillery concentrations to within 100 yards of the front lines in an attempt to neutralize some of this opposition, but although accurate, this fire had little effect. Company K, 3/23 was attached to the 2d Battalion and jumped off at 1600, passing through Company F in an attempt to advance the battalion's right flank to positions abreast of Company E's platoons on the left. This attack lost momentum quickly and netted only 50 yards against determined enemy resistance from the right of the 23d Marines' zone. Enemy mortars again singled out Company E at 1900. A barrage hit the command post, wounding the new company commander and 22 enlisted men, and killing the executive officer. By now this unit was badly disorganized, having suffered heavy casualties and lost two commanders on the same day. When the battalion intelligence officer arrived to take over the company, he became its seventh commander since D-Day. reserve, moved out with only Company B in the assault. The 3d Battalion reverted to division reserve when relieved by 2/23. 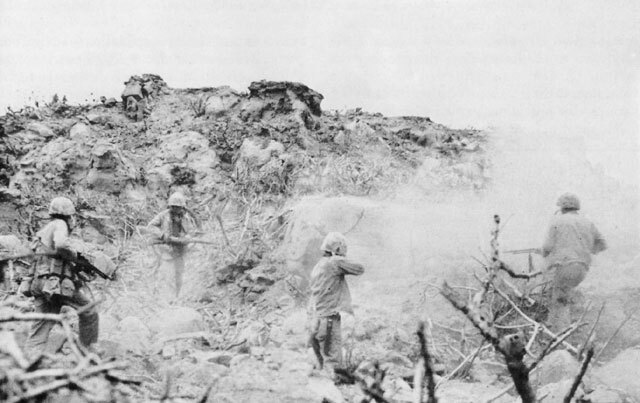 Japanese mortars plus accurate rifle and machine-gun fire hit the Marines as they moved out into the same type of broken terrain as 2/23, on the left. Gunfire support ships assisted the attack by placing fires in the Higashi area, and planes delivered three heavy strikes just southeast of that place, about 1,000 yards ahead of friendly lines. But these supporting fires, as usual, had no effect on the stubborn resistance to the immediate front, and gains by RCT 24 were limited to 150 yards on the left, less than that on the right. 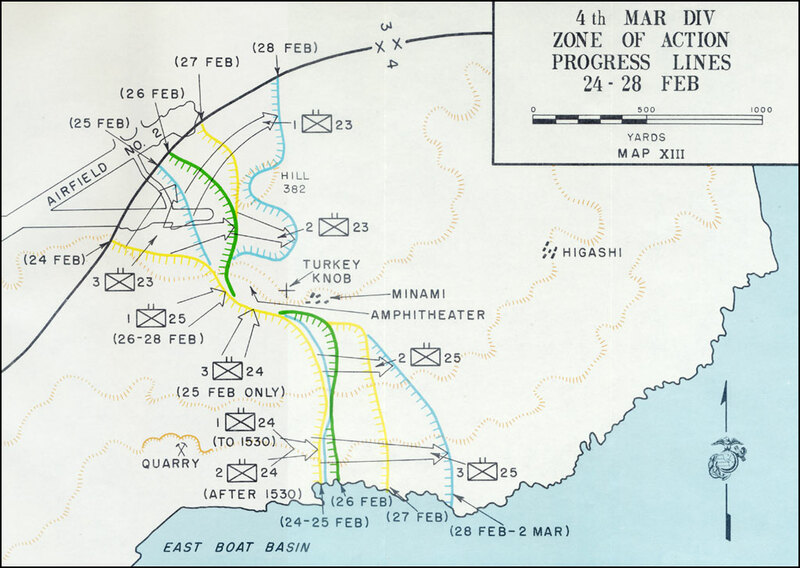 The division operation order for 6 March directed the 25th Marines, with the Division Reconnaissance Company attached, to continue mopping-up operations and hold its positions on the right, conforming to the advance of RCT 24 on the left flank. While the Provisional Battalion hammered at the southern edge of the salient with flame thrower tanks, regular Shermans, and 75mm half-tracks, the 1st Battalion advanced a short distance along the north side to keep pace with the unit on the left. Sporadic enemy mortar fire and several small-scale infiltration attempts marked the night of 6-7 March. 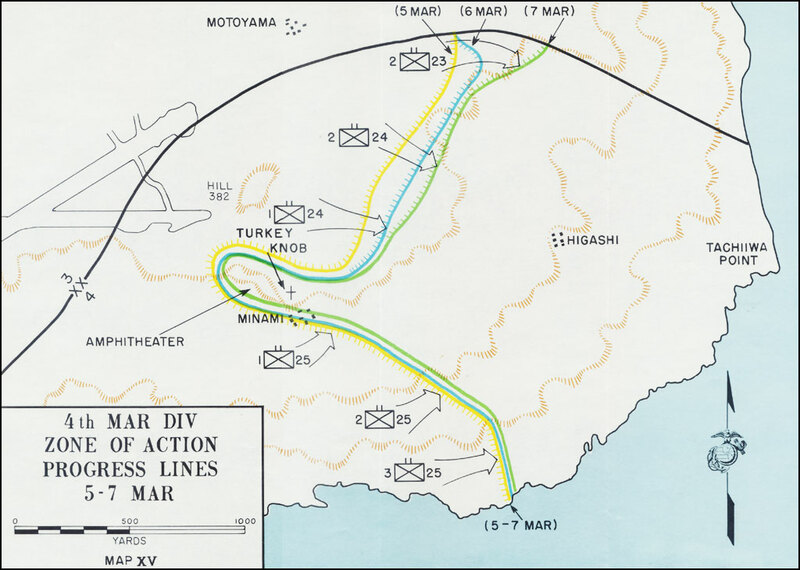 At 2210, 3/25 reported Japanese troops moving across its front toward the ocean in what was thought to be an attempt to attack the battalion right flank. Artillery and mortar fire quickly dissolved this hostile formation. Later in the night, 40 to 50 of the enemy worked their way into the positions of 1/25, some of them even jumping into Marine foxholes. In the melee that ensued, 13 Marines and 50 Japanese were killed. The 23d Marines remained in close contact with the enemy throughout the night, and frequent exchanges of rifle fire and hand grenades occurred. Then, at 0502, the Japanese scored one of their infrequent direct hits with a large caliber rocket on the command post of 2/23, with tragic results. The battalion commander, executive officer, operations officer, adjutant, and two clerks were wounded, and the communications chief was killed. All the wounded men were evacuated except the commanding officer, who immediately commenced reorganization of his staff. Shortly after daylight, however, the regimental executive officer, Lieutenant Colonel Edward J. Dillon, went forward to assume command of 2/23, relieving Major Robert H. Davison, who had been badly shaken by the blast. The temporary reorganization which Davison had started was completed by Dillon, utilizing a skeleton staff of officers and enlisted personnel from regimental headquarters. The attack order for 7 March directed the 4th Division to continue the assault with no change in boundaries or formation. K-Hour was to be 0730, but the jump-off was delayed 30 minutes to give 2/23 more time to recover from the early morning disaster in its command post. The division moved out with no preparation, but the artillery directed neutralization fires on all known enemy mortar and artillery positions from 0800 to 0830. The 23d Marines attacked in a column of battalions with 2/23 leading. Company G on the left made a substantial advance against light resistance, but E in the center and K on the right met stiff opposition and gained little. In accordance with a prearranged plan, Company G pressed the attack to open a sizable gap on its right flank and uncover the battalion reserve, Company F. That unit immediately moved out against the flank of the strong point confronting Companies E and K. This assault succeeded, and Company F took over the center zone from E and continued the attack. On the right, Company K pressed its advance and soon came abreast to straighten the battalion line. This neat little maneuver netted the battalion about 150 yards by 0900. During the remainder of the day, strong opposition held the 23d Marines to negligible gains, with only Company G on the left able to register any important advance. The resistance consisted principally of heavy machine-gun and rifle fire from concealed positions in the rocky ridge formations and draws along the front. In the center of the division zone of action, RCT 24 attacked with 2/24 and 1/24 abreast as on the preceding day. The 2d Battalion fought forward slowly against well-directed automatic weapons and rifle fire until a gap developed between its left company and the right unit of RCT 23. Hostile fire from that flank became extremely heavy, and at about 1500 the enemy began penetrating the gap. In order to close the hole and contain the pocket, the battalion commanders of 2/23 and 2/24 arranged to have Company K, 23d Marines echelon one platoon to the rear to contact a platoon of Company G, 2/24's reserve, which moved up along the regimental boundary on RCT 24's left flank. This cooperative action effectively sealed off the salient, and lines were then adjusted and consolidated all along the battalion front on the most defensible ground. The day's action of 2/24 netted only about 50 yards, but the battalion action report pointed out that resistance in the zone of action had been "notably reduced," except for the pocket on the left flank. The report went on to state that the major portion of the enemy's secondary defensive line appeared to be neutralized, but that units on either flank were still receiving heavy opposition. The 1st Battalion, 24th, passed Company C through B to continue the assault on D-plus-16. During execution of this relief, the enemy opened up with a mortar barrage that hit Company C, causing numerous casualties. This fire continued to fall in that area, and the company became partially disorganized. But at 0800, it moved out and in 45 minutes had progressed 50 yards. Soon after this initial advance, the company commander was killed by a rifle bullet while leading his unit in an attempt to take a bit of high ground on the left flank. The executive officer immediately assumed command and continued the attack. For the remainder of the day, Company C inched forward through crevices and gullies, blowing up caves and working under constant small-arms fire. From a forward observation post, the battalion air officer called two strikes against suspected mortar positions, and heavy artillery concentrations were also delivered in support of 1/24. Still under orders to advance only in conformance with the regiment on its left, the 25th Marines held its original positions throughout the day. The 1st Battalion, on the left, utilized flame and medium tanks to sear and pound enemy installations close to its front, and the Provisional Battalion continued operations against stubborn resistance in the Amphitheater-Turkey Knob area. The 2d Battalion sent a 6-man patrol from Company G about 200 yards to the front. This group returned at 1300 and reported that it had encountered no enemy resistance. The attack would thus compress enemy troops into an area bounded by the sea and Marines holding the line on the south: in effect, a hammer and anvil, with the 25th Regiment now acting as the anvil. two lines of barbed wire about 75 yards apart were also stretched forward of the battalion, with trip flares and booby traps set between them. Three 37mm guns with a supply of canister shells were emplaced in the line, and machine guns were carefully positioned to deliver grazing fire across the front, although fields of fire were limited. All 60mm mortars of the battalion were combined in one battery and registered for close defense and the 81's adjusted to fill the gaps in artillery concentrations to the front. The division made its main effort in the center on 8 March attacking toward the sea along the east coast. Since corps no longer required that the 4th's main effort be on the left, the division again shifted the direction of attacks to the southeast to conform to the character of the terrain. In compliance with corps orders, the division jumped off at 0620 (K-minus 90 minutes) without a preparation, but the 14th Marines and corps artillery fired successive concentrations in support of the attack from 0620 to 0650, and division artillery remained on call after 0650. In the 24th Marines' zone, 3/24 and Company A, which had been attached to 2/24 but was holding a critical portion of the enemy salient along the boundary between RCT's 23 and 24, became attached to the 3d Battalion. The 1st Battalion was ordered to extend to the left to cover a 2-company front, relieving one company of the unit on the left. This battalion would then attack with two companies abreast. Boundaries between the two battalions were adjusted accordingly. The 23d Marines continued its attack on the division left with the same battalion-column formation used on 7 March. The 2d Battalion, in the lead, replaced Company K (attached) with Company E, but made no other changes. Operations along the division line differed little from the day before. Heavy resistance continued in front of the left and center regiments with particularly bitter fighting along the RCT 23-24 boundary. Company A (1/24) eliminated the enemy salient in that area during the morning and went into RCT reserve behind 1/24. The strong center of resistance astride the regimental boundary withstood all attempts to crack it, and as small advances were made on either side, a second reentrant developed. This strong point held out all afternoon, and when regiments tied in for the night, Company E, 2/23 and Company I, 3/24 held long, difficult lines containing the enemy salient between the two regiments. 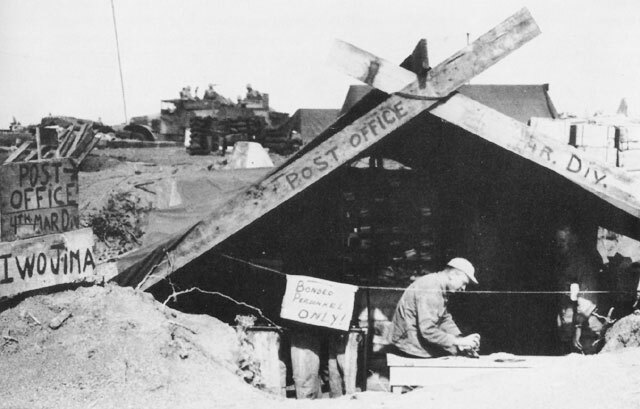 4TH DIVISION POST OFFICE. Nothing did more to lift the spirits of exhausted Marines than a letter. This shipshape and well dug-in installation handled all incoming and outgoing mail for its division. to good advantage as they worked their way close to the lines before commencing the assault. A few even infiltrated through the front lines to the 2/23 command post, where they harassed the operations section with hand grenades thrown from ranges of 10 to 15 yards. Some enemy troops carrying stretchers tried to penetrate Marine lines by shouting "Corpsman"! Close-quarter fighting raged throughout the hours of darkness with Company E bearing the brunt of the attack, but heavy fighting also took place in Company L, 3/24's sector and elsewhere along the line. Shortly after midnight, Company E reported a severe ammunition shortage, and a jeep and trailer were dispatched to the front with a load. The route forward was infested with enemy, and the jeep drew hostile fire as it picked its precarious way to the lines. This company alone expended 20 cases of grenades (500), 200 high-explosive 60mm mortar shells, 200 60mm mortar illumination shells, and uncounted quantities of .30-caliber ammunition for machine guns and rifles. In addition to illumination fired by Company E and other front line units. Support ships expended 193 star shells during the night. Maps and documents recovered from the dead revealed the major Japanese unit in the counterattack to be the 1st Company, 310th Independent Infantry Battalion, reinforced by a machine-gun platoon and one infantry platoon. Other identification indicated that elements of the 3d Battalion, 145th Infantry Regiment, the 314th Independent Infantry Battalion, an engineer unit, and naval units had also engaged. These enemy troops were well-armed and equipped, and many carried demolition charges. The attack was preceded by an all-out artillery preparation augmented by rockets, grenades, machine-gun and rifle fire, demolition charges, and magnetic mines. The Japanese used everything they had. Many of the heavy rockets and mortar shells were duds, however, and fell harmlessly in rear areas.
. . . At first glance these last two entries in the course of the attack [South Beach and Suribachi] may seem puzzling; but in the light of past experience, it must be remembered that Japanese troops usually shoot the works when launching counterattacks and often choose impossible objectives. It is perfectly plausible that these troops (uninformed because of communication breakdowns) hoped to join forces in the area north of Airfield No. 3, sweep down to the beaches originally occupied by BLUE (friendly) forces and eventually capture Mount Suribachi. If so, it would appear the whole scheme was an all-out effort. . . . The division resumed the attack at 0700 on 9 March, following a 10-minute preparation. MOPPING UP by-passed enemy soldiers was a continuous operation. These Marines have just thrown a grenade and are standing by with rifles and BAR's at the ready. In the 23d Marines' zone, the 2d Battalion advanced its center and right a considerable distance against fairly light opposition, but the left was held up by fire from a ridge along that flank. South of RCT 23, the 3d Battalion, 24th Marines still encountered determined opposition from the strong point along the RCT 23-24 boundary. The first attack failed to penetrate this core of resistance, but a second assault at 0900 succeeded, and the battalion pushed ahead 300 yards during the remainder of the day. With all units of the division now decimated by casualties and exhaustion, companies were frequently shifted from one battalion to another to bring assaulting organizations up to effective strength. On 8 and 9 March, however, RCT 24 found it necessary to reorganize its 1st and 2d Battalions, disbanding one company in each and using the men from those units to augment the remaining companies. Now the 1st Battalion included Company A with 135 effectives and Company B with 115. This battalion also changed commanding officers when Lieutenant Colonel Austin R. Brunelli, the regimental executive officer, took over. The 2d Battalion, which ended up with Company F and Company G, each mustering about 150 men, became attached to RCT 25 and was sent to relieve that unit's 3d Battalion on the division right flank. The 24th Marines (less two battalions) reverted to division reserve on 10 March, and the division attacked with RCT 23 on the left and RCT 25 on the right. The 1st Battalion, 24th Marines was withdrawn from the line and replaced by 3/25, but 3/24 became attached to RCT 23 and continued to operate in its former zone of action. The 2d Battalion, 24th remained attached to RCT 25. The division attacked at 0800 following the last coordinated corps and divisional artillery preparation of the operation. These fires blasted the area just forward of the lines for 25 minutes before K-Hour, then lifted to move forward in successive concentrations of 100 yards every five minutes until K-plus 15. The left regiment (RCT 23) moved out with 2/23 and 3/24 in the attack, the latter on the right. Progress was steady against light opposition on the right, but enemy troops holding strong positions in the rocky ridges along the division left boundary directed accurate and effective machine-gun and rifle fire against the left, making gains on that flank difficult and costly. Small pockets of resistance challenged the advance throughout the zone, but assault units bypassed these whenever possible, leaving them to be mopped up by engineer-tank-infantry teams using flame throwers and demolitions. Marines had moved 700 yards in the 23d's zone of action by 1500 and reached positions approximately 500 yards from the beach along the east coast. The regiment held up on this commanding ground but sent patrols forward to feel out the enemy. 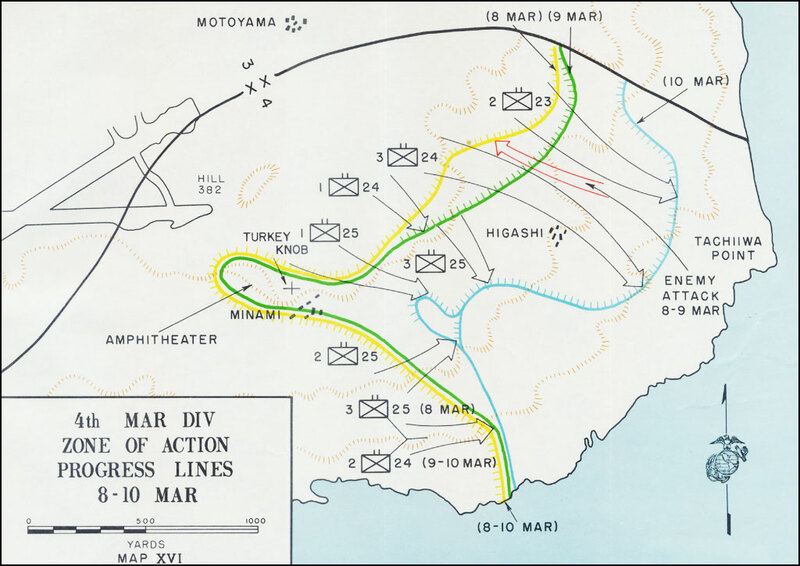 Patrols from 2/23 penetrated to the coast near Tachiiwa Point, and men from 3/24 scouted to within 100 yards of the coast in that battalion's zone. Returning at 1700, these units reported no contact with the enemy. The 1st and 3d Battalions jumped off at 0800 as ordered and encountered medium to heavy opposition in the high ground to their front where the enemy had held out so stubbornly for nearly two weeks. When it became apparent that the 3d on the left would be able to move faster than the 1st, the former unit was ordered to continue without regard for its flanks. As 3/25 drove to the southeast, 2/25 advanced northeast to meet it. Shortly after noon the center company of 2/25 made contact with the right flank of the 3d Battalion, and by 1600 those two units had occupied the controlling ground in the vicinity. In swinging out to join forces with 3/25, however, the 2d Battalion bypassed a small force of enemy troops. This pocket was surrounded by units of 1/25 and 2/25 that had been pinched out as the advance crossed their front. After a push of 600 yards, RCT 25 consolidated for the night with its left flank tied to RCT 23 about 800 yards from the coast, and its stationary right flank still positioned along the beach. During the night, the greatest activity occurred around the pocket that had formed during the day's advance. The rest of the front was quiet with only sporadic attempts at infiltration. During the 14-day period covered in this chapter, the 4th Division, in constant head-on assault, fought its bloody way from Charlie-Dog Ridge past Hill 382, the Amphitheater, Turkey Knob, through Minami and formidable defenses northeast of 382, almost to the coast. The slow but relentless movement of this division front can be compared to the closing of a giant door. The right flank, which advanced less than 1,000 yards, acted as a hinge while the rest of the division (the door) turned upon it and attacked northeast, east and southeast to close and sweep trapped enemy forces toward the sea. The Japanese conducted an astute defense. General Kuribayashi had planned well, but much credit for execution of the plan in the 4th Division zone must go to Major General Senda, who commanded the 2d Mixed Brigade and exercised tactical control during the battle. Enemy weapons and mine fields were well placed to take maximum advantage of terrain features, fire control was excellent when judged by Japanese standards, and camouflage discipline outstanding. Machine-gun positions controlled draws, while mortars were disposed to deliver fire on routes of approach, including the crests, forward, and reverse slopes of ridges. The one obvious mistake made by the Japanese in this long, grueling defense to the death was the night counterattack of 8-9 March. This action cost the enemy many lives and gained no advantage. Even this rather hopeless plunge can be somewhat justified, however, when the situation that existed then is seen from the Japanese point of view. By 8 March, the enemy was under heavy, constant pressure in an ever-shrinking area where most of the critical terrain features had been captured. He was quickly becoming dispossessed and disorganized, with few courses of action remaining. Because communications were undoubtedly badly disrupted, it is possible that the enemy facing the 4th Division did not realize just how hopeless his cause appeared and therefore harbored some hope that the counterattack might not be in vain. Against the obstinate enemy defense, 4th Division Marines had no alternative to continuous frontal assault. Constant attempts were made to flank or envelop enemy strong points throughout the operation, but the mutually supporting fortified positions and the restricted areas of operations prevented successful flanking action on a large scale. Not until the latter stages, when the left regiment had advanced to a favorable position on the division's northern flank, was it possible to move down the ravines to the sea. Unsuitability of terrain for the employment of heavy direct-fire weapons, such as the tank-mounted 75mm gun and the 75mm half-track. Relative ineffectiveness of artillery, air, and naval gunfire against heavy installations. Lack of a portable direct-fire weapon capable of breaching concrete installations. The 4th Division suffered a total of 4,075 casualties during the 14-day period from 25 February through 10 March. 1. Unless otherwise cited, material in this chapter is based on the following: 4th MarDiv OpRpt; 14th Mar OpRpt; 23d Mar OpRpt; 24th Mar OpRpt; 25 Mar OpRpt; 4th TkBn OpRpt. 2. Capt. J.W. Thomason, III, USMCR, "The Fourth Division at Iwo Jima", a manuscript, 21Aug45; 4th MarDiv D-2 Periodic Rpts; 4th MarDiv Preliminary POW Interrogation Rpt No. 5, 27Feb45. These defenses, prepared by the 2d Mixed Brigade Engineers, were reported by POW's to be the most extensive and powerful on the island. This terrain is also described briefly in the account of the 4th MarDiv action on D-plus-5, Chapter V of this monograph. 3. 4th MarDiv D-2 Periodic Rpt No 62, 5Mar45. 4. Bad weather had interfered with ammunition resupply for naval gunfire support ships and caused a limitation on expenditure of illumination and 5-inch shells. But by D-plus-6 the situation had improved, and the allotment was increased from 50 to 75 star shells and from 400 to 500 5-inch shells per ship. TF 51 Rpt, Pt V, C, 24, 26, 38. 5. When the Bismarck Sea was sunk and the Saratoga damaged on the evening of 21 February, the five tactical air observers and one of two VMO-4 pilots on board the former were rescued, but for the next four days the 4th Division was without tactical air observers and used the 5th Division carrier-based observers. With the landing of two VMO-4 planes on 26 February, however, the division resumed its own tactical observation, using secondary and volunteer observers until the return of the regular men. In addition, air spot for 4th Division artillery was provided continuously from 20 Feb to 12 Mar by observers in TBM aircraft from the Wake Island (CVE). 4th MarDiv OpRpt, Annex C, 10, 11, 15. 6. The 3d Division's action during this period is covered in Chapter VI, "Hills PETER and 199 OBOE." 7. The quotes in this paragraph are all taken from 4th MarDiv D-2 Periodic Rpt No. 55, 26Feb45. 10. As indicated in previous chapters of this monograph, the corps 155's were under orders to give priority of fires to the 3d Division during this period, but reinforced the 14th Marines on D-plus-8 with 300 rounds for the preparation, and fired 25 percent of the general support missions throughout the day for the 4th Div. 11. Company E, 2/23 had been attached to 1/23 on the previous day. When 2/23 was committed on D-plus-9, Company E, 24th, was attached to bring the 2d Battalion more nearly up to strength. 12. 4th MarDiv OpRpt, Annex C, 27. 14. 4th MarDiv D-3 Periodic Rpt No 55, 28Feb45. 17. 4th MarDiv D-2 Periodic Rpt No 57, 28Feb45. 20. Interview LtCol R.E. Carey with author, 20Jan53. Then a captain, Carey commanded Company E, 2/24 at Iwo. 21. VAC OpOrder 10-45, 1Mar45. 22. Maj F.E. Garretson, USMC, "Operation of the 2d Bn., 24th Marines on Iwo Jima, Volcano Islands, 19Feb-18Mar45," Advanced Officer's Course, The Infantry School, Ft. Benning, Ga., 19Feb47, a monograph, 25. 23. 4th MarDiv D-3 Periodic Rpt No 57, 2Mar45. 24. The commander of 3/25 notes in his action report: "The failure of 3/25 to advance while suffering casualties . . . had a depressing effect on the morale of the troops in 3/25." 25th Mar OpRpt, Appendix 8, 11. 25. The landing force was well pleased with the air support on 2 March: "Performance of air coordinators, air observers, and air strike groups highly satisfactory during today's operations. Many difficult close support missions executed in restricted areas to full satisfaction of front line units. Please pass to all concerned." Disp LANFOR to CTG 52.2, 1952, 2Mar45. 26. 4th MarDiv OpRpt, Sec IV, 32; 4th MarDiv D-2 Periodic Rpt No 59, 2Mar45. 27. This 0630 attack by the 4th Division was not a predawn jump-off as early morning twilight began at 0541 on 3 March, but it was 27 minutes before official sunrise. TF 51 OpPlan, Annex B, Daylight and Dark Tables for Mar45. 28. In the early morning it was frequently possible to locate Marine foxholes in the broken terrain by observing the ghostly columns of steam that hung in the cool air. Interview LtCol F.E. Garretson with author, 23Jan53. 29. 4th MarDiv D-3 Periodic Rpt No 59, 4Mar45; 4th MarDiv D-2 Periodic Rpt No 61, 4Mar45. 30. Disp VAC to 3d, 4th, 5th MarDivs, 1624, 4Mar45. This order is quoted in Chapter VI of this monograph. 31. VAC OpOrder 13-45, 5Mar45. The 3d and 5th Division participation in this attack is covered in Chapter VI and Chapter VII. 32. 4th MarDiv D-3 Periodic Rpt No 61, 6Mar45. 33. 4th MarDiv D-3 Periodic Rpt No 61, 6Mar45. 34. Unless otherwise cited, the narrative of the counterattack is based on the following: 4th MarDiv D-2 Periodic Rpt No 66, 9Mar45; 4th MarDiv D-2 Language Section, "Reconstruction of Counterattack Stopped by BLT 2/23 on Morning 9 March;" 23d Mar OpRpt; 24th Mar OpRpt. 35. The 2-day period has been used for comparison because the counterattack began the night of 8 March and continued during the early hours of 9 March. 36. 4th MarDiv Support Group Rpt, 17, 18. 37. 4th MarDiv D-2 Periodic Rpt No 63, 6Mar45. 38. 4th MarDiv OpRpt, Annex C, 3.